Grand private Krakow tour (Old Town, Jewish Quarter). 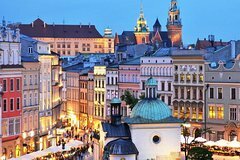 A special product has been created for you: a six-hour walking tour of Krakow, including lunch time at a restaurant serving Polish traditional cuisine. You will see all the main sights, appreciating the Polish culture also from the culinary side. The guide will tell you about the history, amusing cases, dishes of Polish cuisine. Duración: 5 to 6 hours.